Exporting and Importing agents allows you to easily move your web scraping agents between machines. You can also export your agent for back-up to another device. To export your agent, first make sure you save your agent and have it open. Then from the File menu, select Export Agent. The following Export Agent pop-up window will appear on your screen. 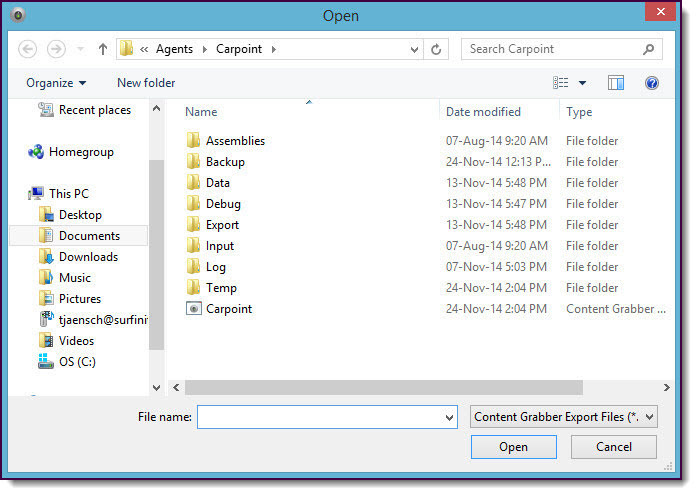 Content Grabber's Export Agent facility enables you to package up all the associated files and folders into one file in a manner that is similar to a zip file. The default location for where agents are exported is the Documents > Content Grabber > Agents folder on your PC. You can also elect to Include internal data and/or Include export data into the export file by selecting the corresponding check box. Once you have made your selection, simply click the Export button. 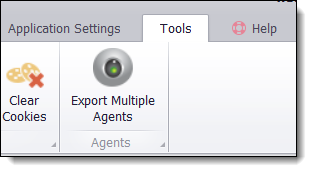 You can export multiple agents at once using the Export Multiple Agents button in the Tools menu. For detail on the Create self-contained agent check box, refer to Building a Self-contained Agent. You can only import agents that have previously been exported from Content Grabber. To do this, select Import Agent from the File menu. The following Export Agent pop-up window will appear on your screen. Simply select the Content Grabber agent file you wish to Import and then click the Open button. All the folder structures and associated files for the agent will then be unpacked into the Documents folder on your machine.